I’d known of Jascha Spivakovsky’s name for many years largely because of his brother, the virtuoso violinist Tossy. Together they formed a formidable duo. Much more biographical information can be gleaned from Pristine Audio’s website and from the Spivakovsky Foundation, which has produced this inaugural disc, with the transfers being prepared by Crystal Mastering in Melbourne, and XR re-mastering by Andrew Rose of Pristine Audio. I stress the technical matters because these are non-commercial recordings, largely made at Spivakovsky’s home in Australia in the 1950s and 1960s. On the websites one can read the adulatory reviews that Spivakovsky received. Indeed many a violin fancier has probably wondered quietly whether the German Parlophone 78s Tossy made in Berlin featured Jascha as accompanist. In the fashion of the day the label respects the player’s anonymity but, whoever it is, he or she is a fine pianist. The disc is fashioned, as intended, as a kind of recital with a generic series title of ‘Bach to Bloch’ – but don’t expect any Bloch here. Things start with the grandeur of the Bach-Liszt Great Organ Fantasy in G minor, complete with powerful grandeur but also a degree of clarity and refinement of voicings as well. For a private recording, made in somewhat unfavourable circumstances from the sound of things, this comes over with commendable amplitude. The Waldstein Sonata is quite personal and individualistic with some telling rubati in the first movement and plenty of tonal graduation. His technique is shown at its most pronounced in the finale where he utilises fingerings that allow pretty much everything to be heard in the coda, a prodigious piece of playing which had much earlier impressed even so celebrated a Beethovenian as Schnabel, who even went as far as to utilise these fingerings, with due acknowledgement, for his pedagogic work. This home recording was made in Melbourne in 1962. Kabalevsky’s F major sonata was much played by Russian pianists in the West – Moiseiwitsch and Horowitz prominently – and Spivakovsky plays it with a comparable degree of brilliance. In the end, though, I find Moisewitsch’s conception the more telling and his solution to the cantabile marking in the second movement is more persuasive than Spivakovsky’s relatively daring slowness; the ebb and flow is better resolved by the former, who is the wittier in the finale as well. The quartet of smaller pieces offers the most divisive interpretative playing. The notes proclaim Spivakovsky to have been lauded as ‘the finest living interpreter of Brahms’ which is inconceivable from this stop-start performance of the Romanze in F major, Op.118 No.5. Retardation of rhythm – something of a besetting sin in his playing – destabilises Debussy’s Ce qu’a vu le vent d’Ouest which lacks intensity and momentum and is heard in a rather watery recording too. Minstrels is no better – too heavy and slow and lacking wit. Clearly Debussy was not Spivakovsky’s metier. His Chopin Ballade is certainly better and technically eloquent - though one can hear a lot of restoration has taken place on the surviving tape. 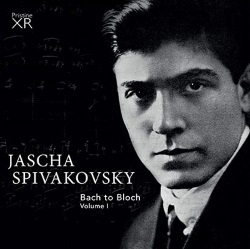 The jewel case blurb is full of extravagant assertions about Spivakovky which says more about the genuine dedication of the Foundation to make these recordings available at last and, in so doing, putting right a long-standing wrong. More flinty-hearted readers will not allow themselves to be swayed too much by this, but can soberly admire his art in the context of the pianism of his time.